The minister for the status of women says research suggests the number of missing and murdered indigenous women could be as high as 4,000, far above the figure long reported by the RCMP. Canada's minister for the status of women suggests the number of missing and murdered indigenous women could be as high as 4,000, but a dearth of hard data means it's all but impossible to pinpoint an accurate figure. Patty Hajdu told reporters Tuesday that the government doesn't have an exact number, but pointed to research from the Native Women's Association of Canada (NWAC) that puts it at 4,000, much higher than a figure near 1,200 the RCMP has previously stated. 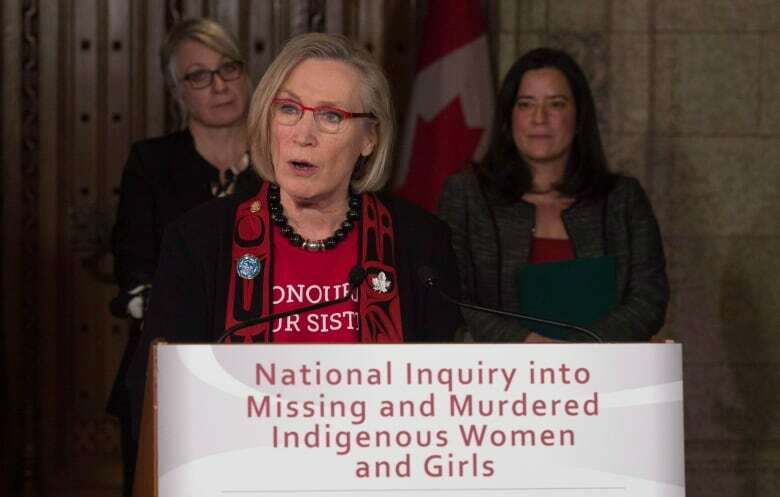 The comment comes after Hajdu and Carolyn Bennett, the minister for indigenous affairs and northern development, wrapped up cross-country talks Monday ahead of a formal national inquiry into missing and murdered indigenous women. Activists working for the Walk 4 Justice initiative started collecting the names of indigenous women who are missing or murdered — they stopped counting when they got to 4,232. Dawn Lavell-Harvard, the president of NWAC, said the names of those women were shared with her organization and Chuck Strahl, the former Conservative minister of Indian affairs and northern development. No further action was taken at the time. Lavell-Harvard said the anecdotal evidence was also shared with the Liberal cabinet ministers during the recent pre-inquiry talks. However, when CBC News contacted one of the activists who supplied NWAC with the information, she said "roughly 60 to 70 per cent" of the 4,000 or so people on her list were indigenous. Gladys Radek, co-founder of Walk 4 Justice, said her group collected the names while speaking to people during a trek across Canada in 2008. They stopped collecting information in 2011. NWAC said the confusion around the number emphasizes the need for clear data on this issue. "Lives are too important to rely on an informal database," Lavell-Harvard said. "The gulf between 1,200 and pushing 4,000 is huge. Even if it is somewhere in the middle, it is still an outrageous number to [not have been investigated] until this point. I think that's why it's so important that this inquiry happen," she said. A 2014 report by the RCMP concluded 1,017 aboriginal women had been slain between 1980 and 2012, and that another 164 were considered missing. Hajdu, who represents Thunder Bay–Superior North, said the 4,000 number is more believable because there is a history of police underreporting homicides, or failing to investigate suspicious deaths. "When you actually start to add in, you know, disputed cases, for example, people that have claimed it's a suicide or death due to exposure, but in fact there's symptoms or signs that maybe it wasn't, then of course the numbers jump," Hajdu said ahead of a Liberal cabinet meeting. Bennett, for her part, would not speculate, but has said that the number is "way, way higher," than the RCMP's 1,200 figure. "I don't have the data, but I know the problem is not about us fighting about the numbers. The problem is making sure that these families that lost a loved one, these survivors that are still living, that their stories lead us to the kind of concrete actions that will actually put an end to their vulnerability and what has been going on," Bennett said Tuesday. The minister said the RCMP "did their very best" in trying to come up with an accurate number, but she said the testimony she heard at the pre-inquiry talks puts that figure in serious doubt. "We have heard enough stories to hear that if you count these deaths, that were called a suicide or other things, we have anecdotal evidence that the problem is greater," she said. "I think it's important we look to the root causes." Lavell-Harvard said the RCMP's number is incomplete because of a history of mistrust between the police and indigenous communities. "Part of the challenge comes from the fact that very often many families, because of negative interactions in the past, because of racism, have not in fact reported when a loved one goes missing," she said in an interview with CBC News on Monday. "There's a lack of willingness to trust police forces and to come forward." Bennett said many families of missing or murdered indigenous women want police to dust off cold cases, or actually launch investigations. "The families want certain cases reopened, we heard that coast to coast to coast. But there's also the common theme of the uneven application of justice, from the quality of the search to whether it's called a murder or not, to the charges that are laid, to the plea bargaining ... it seems to the families that this is very different if the victim is indigenous," Bennett said. "What the families would say is that a lot of these cases were never opened in the first place because there was never an investigation ... time and time again the family will tell you that the file is empty. There was no investigation." Lavell-Harvard said finding justice for indigenous families will be at the heart of a national inquiry. "If there has been [police] misconduct, then it needs to be addressed," she said. "That is going to be absolutely central to reopening some of these cold cases that have been sitting for many, many years. If we find there wasn't an adequate investigation in the first place, then those need to be looked at; our women deserve that much," she said.